Vladimir Putin has signalled “mission semi-accomplished” in Syria as Russia announced the start of a withdrawal of forces, beginning with the departure from the Mediterranean of a naval group led by the Admiral Kuznetsov aircraft carrier. “In accordance with the decision of the supreme commander of the Russian armed forces, [President] Vladimir Putin, the Russian defence ministry is beginning the reduction of the armed deployment to Syria,” the military chief, Valery Gerasimov, said. 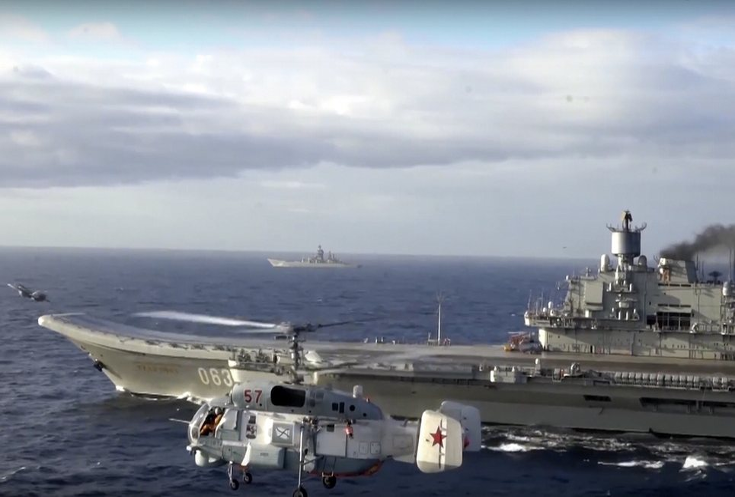 Expert opinion is divided over whether the Kuznetsov’s journey to the Mediterranean in October added anything militarily beyond a symbolic show of naval force. Putin ordered a reduction in his forces in Syria on 29 December, coinciding with the start of a ceasefire brokered by Turkey and Russia. The fragile pact, which excludes Islamic State and the al-Qaida-linked Fateh al-Sham, is designed to pave the way for peace talks in Kazakhstan later this month aimed at bringing an end to Syria’s six-year conflict. The Russian president previously announced a partial withdrawal of Russian forces in March 2016, only to increase their presence again as fighting intensified. But it is likely this time around that Putin feels his Syrian ally and counterpart, Bashar al-Assad, is militarily, if not politically, secure. Russia still has sufficient air defence capabilities with the S-300 and S-400 systems deployed in Syria. Moscow launched a bombing campaign in Syria in September 2015, helping to turn the tide in favour of Assad. By the turn of the year, only 23 Russian soldiers had been killed, according to official figures, defying US administration predictions that Moscow would become bogged down in a quagmire. Syrian regime forces targeting Aleppo were aided by Russian firepower on land in Syria and off the coast in the Mediterranean. Troops loyal to Assad finally ousted rebels from the city last month in their biggest victory in more than five years of fighting, paving the way for the Kremlin to launch a fresh push for a political solution to the conflict. Many rebel fighters and western diplomats claimed it was Iranian-backed artillery as much as Russian air power or Syrian ground forces that made the regime’s siege of Aleppo impossible to stop. The ongoing presence of Iranian-backed forces in Syria has led Turkey to warn that the Astana talks are in jeopardy. Fighting in Syria is set to continue, notably in the north-western province of Idlib. Opposition fighters pfrom Aleppo and other towns where sieges have been lifted have been sent to the province and the Assad regime said on Thursday it was ready for an open battle with opposition forces there. East of Idlib, in Raqqa province, Kurdish-led forces said yesterday that they had taken control of a castle on a hilltop overlooking a strategic town held by Islamic State, less than 20 miles from the militant group’s de facto capital of Raqqa city. The advance also brings the Syrian Democratic Forces within four miles of the strategic Tabqa dam and town. Isis is also fighting the Syrian army in Deir al-Zor province and near the city of Palmyra, which Isis seized for a second time in December. There has also been fighting between the Syrian government and opposition groups in the Barada valley north of Damascus, disrupting the water supply to millions of people living in or around the Syrian capital. Government aircraft dropped at least 10 barrel bombs in the area on Friday, the Syrian Observatory for Human Rights said. The UN’s humanitarian adviser for Syria, Jan Egeland, said on Thursday it was impossible to tell if disruption to water supplies had been caused by Syrian government bombardment or rebel sabotage, but warned both sides that targeting water sources constitutes a war crime.